An upbeat tale of the ultimate holiday rush, “Saving Santa” starts at the top – the top of the North Pole, that is – where Bernard (Martin Freeman), a low-ranking Elf, dreams of one day joining Santa’s elite team of great inventors, the very elves who make the magic of Christmas possible! But when one of Bernard’s wacky inventions accidentally reveals the secret location of Santa’s workshop to an eccentric billionaire scoundrel (Tim Curry), Santa (Tim Conway) and Christmas itself are in jeopardy. It’s up to Bernard to time-travel (again and again) to get Santa home in time for Christmas! 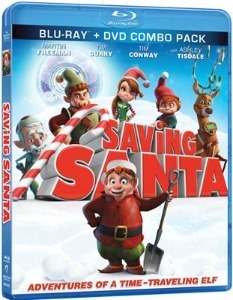 In addition to its collection of top talent and non-stop, action-packed entertainment, “Saving Santa” features must-see bonus content, including the animated music video for “Some Kind of Miracle” sung by Ashley Tisdale (voice of Shiny), “behind-the scenes” voice recording sessions with the film’s talent and a special “Why Saving Santa?” featurette! As I’ve said before, I’m always happy to add to our Christmas movie collection and one of our latest additions is Saving Santa from Anchor Bay Entertainment. Saving Santa is an animated movie perfect for families. The billionaire can be a bit scary but there is nothing in the movie that is specifically only for an older audience. My 2.5 year old didn’t pay attention to the whole thing from start to finish but played while he watched and enjoyed certain parts more than others. My 6 and 7 year old watched the whole thing with me and we all enjoyed it. My favourite part was the reindeer. The reindeer can’t talk but can communicate and the reindeer is hilarious. It’s a fun holiday movie to add to your collection.